What I enjoy most is seeing the satisfaction of others eating the food and being able to provide for somebody else. 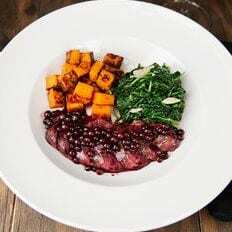 One of my favorite parts of cooking is seeing everything come together on the plate. Cassie Kelsch attended Manila High School in Manila, Utah and while in high school she volunteered to cook meals for the homeless, firefighters, and the local police force. She also helped bake goodies for bake sales and fundraisers for her school as well. 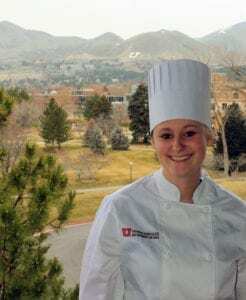 Cassie was enrolled in the Prostart program through the Utah Restaurant Association, where she gained her ServSafe certification and ignited a passion for the culinary arts. She was in the program for three years and during the last two years she was captain of the Manila High ProStart Culinary team. They went to state both years; won best appetizer as well as an award for her teamwork and organization the first year, and then won best dessert the second year. Cassie gets her passion for cooking not only from ProStart but from her dad and grandma’s passion for food. Ever since she was little she would visit her grandma’s house and cook all kinds of treats but the most common was homemade chicken noodle soup and donuts. Cassie currently works at the University of Utah under the guidance of award winning Executive Chef Peter Hodgson. After gaining experience in the kitchen Cassie hopes of becoming an executive chef and owning her own restaurant. Thank goodness the answers are unlimited. We see food and eat everywhere. I travel to different cities, taste local favorites, and test new ideas on my family at home. I’m also a huge fan of magazines. To what degree do healthful menu items (based on inherent health, diet-related health, and lifestyle) influence your menu? Greatly. People forget that whole foods (especially fruits and veggies) taste good. To Taste was developed to help improve the American diet. It’s our job to teach the minds of young children and adults to broaden their palettes, remembering how good whole foods taste when seasoned well and eaten seasonally. Any predictions on food trends in the near future? Anything global. Also, the combination of spicy and sweet. This really surfaced in 2016, but it will continue to be a 2017 favorite. Simple and flavorful. We are a busy family, and timing meals is important. These recipes turn more common ingredients into uncommon recipes. My father, he owns his own company, and has encouraged me to be a leader. Bette Mogg, Director of Food Service at Mesquite ISD, for teaching me the reality of menu planning in a school food service operation, and Chef Cyndie Story, for her guidance and inspiration as a consultant in school food service culinary training. Teaching. It’s so fun to see someone’s facial expression when they learn something new. Also, food is a science, and I love experimenting! I find pure joy in perfecting recipes. Make a cake ten different times to meet perfection…sure! I want to be everywhere at once. I want to teach, present, learn, and travel all the time. Thank goodness for modern technology, but it’s always more fun to be somewhere in person. Huckleberry GastriqueI thought of items that would be complimentary with bison; I thought about a southwestern menu with different ingredients to compliment it and then I decided to try and incorporate something locally from where the competition would be held and I ended up coming up with a huckleberry demi-glaze since the region competition was in Montana. 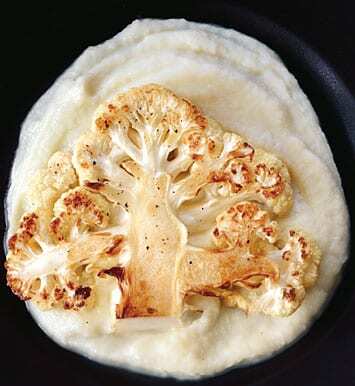 Cauliflower PureeWhen I was growing up some of my family was of German descent and we had “German dinner night” every week. My favorite menu was sauerkraut and potato cakes with brats. 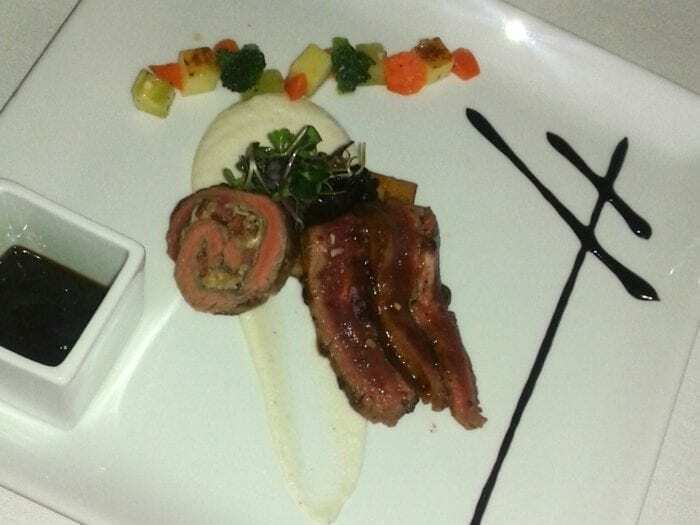 Bacon Bleu Cheese RouladeI honestly like everything but I do kind of love decorating deserts and plating is one of my favorite things to do.